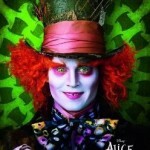 Tim Burton films have always been renowned for their gloriously colourful palette and outlandish yet beautiful costumes. 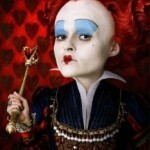 Make-up plays a huge role in the upcoming Alice in Wonderland remake, with Alice’s fragile and natural beauty juxtaposed against the heavily and theatrically painted face of Helena Bonham Carter’s The Red Queen it is a beauty lovers dream. 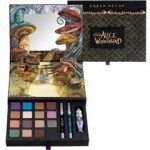 Urban Decay’s Alice in Wonderland themed Book of Shadows is a charming compact featuring a 16 shade eyeshadow colour palette, 2 24/7 eyeliners and an eyeshadow primer potion. Most of the shadows are ether best selling shades or inspired by the films palette and have been renamed in homage to Alice and the original fairytale naming a sparkling white shade White Rabbit and labelling a deep cocoa brown The Mad Hatter. The collection, which is already available in the US comes in beautifully crafted 3D pop up packaging which depicts Alice’s journey through the mushroom forest. A must have for any Alice or beauty lover, however when it comes to the U.K in March there will be a limited release of only 2000. Better sign up to the waiting list now girls!